Anyone with an addictive personality out there? Thought so. Me too! But it’s not all bad…not when it’s something like these veggie wraps. I literally can’t stop eating them right now. I already know they’re gonna be a major part of my summer. Kat will soon rue the day she modified the recipe, made it even tastier than it was before, and then introduced me to it. That being said, no cooking skills are needed for this one (unless you count roasting a few seeds in a pan, I suppose). It’s literally just throwing the right ingredients together, so I’ll have no excuses! The dijon mustard (you can use wasabi if you prefer) gives the whole wrap a subtle background tang – but it’s not overpowering. I’m not a massive mustard fan to be honest, but mixed with the cottage cheese and yogurt I can suddenly see what all the fuss is about. 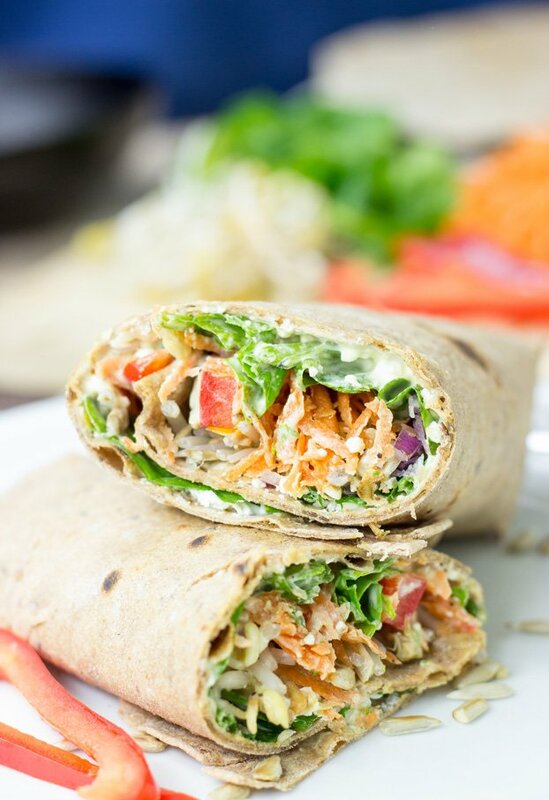 The sunflower seeds add an unexpectedly juicy and smoky flavour to the mix, while the carrots and peppers contradict the soft wraps with a snappy crunch. 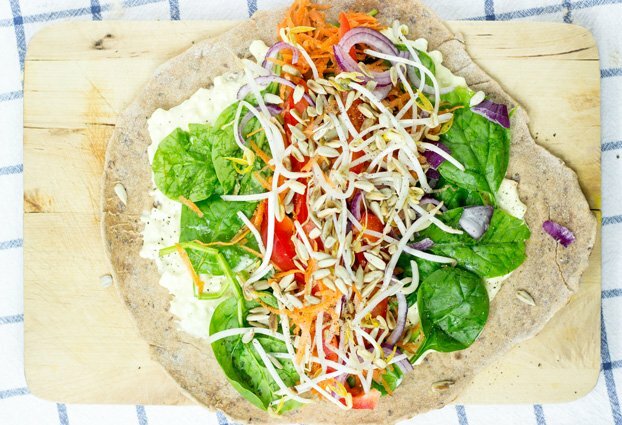 We like to make this wrap with spinach leaves – while it’s rare that anyone comes forward saying ‘ooh spinach, my favourite food’ it is just so incredibly good for us. Packed with vitamins, nutrients and lots of flavonoid compounds that act as anti-inflammatory and anti-cancer agents it quickly becomes obvious that it really is something we should be eating. Spinach is also the second highest food in the world for it’s vitamin K ratings, providing a crucial role in both bone health and blood clotting. 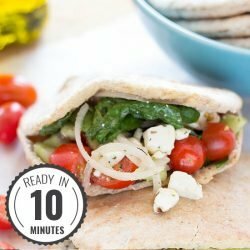 A refreshing and tangy summer veggie wrap that’s easy to make and perfect for on the go - ideal for bbqs, picnics or wherever it’s needed! 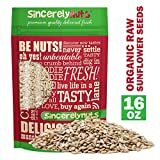 Roast the sunflower seeds in a pan without any oil/fat until golden brown. IF YOU LIKED THIS RECIPE: Try out one of our other recipes - if you have a lot of spinach leaves left our satisfying Baked Eggs in Spinach and Tomato are a great breakfast or our delicious Spinach Tomato Quesadillas should hit the spot. Who wants to waste good food after all? I’m on your side with the mustard (except Wholegrain mustard which has much less of a kick) I’m not a huge fan but I find some foods just don’t taste quite the same without it. I’ve tried leaving it out of my homemade mayonnaise but it doesn’t taste right. I think we must be competing for worst place to live for sunny weather. I think we’ve managed a total of two really sunny days so far this year! 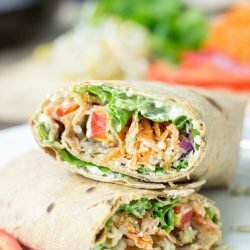 I love veggie wraps! When I do remember to eat, they’re my to go meal. I fill mine with spinach, rocket, avocado, cucumber and whatever veggie spread I may have. i’ll try out the mustard next time. Also Howie, ermmmm…..why are your photos so damn good? Here I am glowing green with photo envy! Veggie wraps are the best! I love all of the flavours you used in these – the wasabi sounds great! 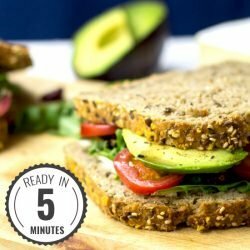 This is the perfect, healthy, quick to make meal! Love this recipe! Love it…looks so colorful..and it is much simpler than I thought it would be. Tangy 🙂 ..I love tangy foods..and this looks super healthy and yummy. What an insanely unique spin on a wrap!! Yogurt in a wrap?! Not many people think to ever do such a thing! ha! PS: YES! I WANT IN ON FREELETICS!! WHAT WHAT! Never would have thought of it. Other than that, the recipe looks great, I have saved it and will be trying it soon! Thanks a lot for the comment, our mistake. I just updated it. Yep, it’s the bell pepper, thanks for mentioning! DUDE this looks amazing. And you read my mind with the hummus substitute! Definitely gonna try this out! This looks so good! And I love that you include the nutrition breakdown! How large are the wraps you use? Also, I’m assuming 1 wrap equals a serving? I’m super stoked to try this this week!! Trying this out – now !! Love to see you young people serving up delicious and very healthy food and sharing your recipes with us. I’m confused, this looks great, all the comments say it’s good too. I followed the recipe exactly and I really just can’t eat it, it’s terrible. I’m not picky eater by any means either. anything you can think that I could’ve messed up? Oh no! 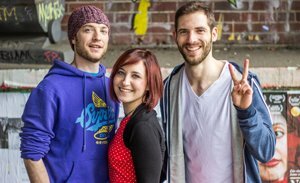 This comment actually hurt me quite deeply – I love this recipe! 🙁 hmmm I’m not really sure what to say. What did you not like about it? Could it be that one of the ingredients was off? I mean, not every food is for everyone….but still! Step 3 still says paprika instead of pepper. Perhaps you put some paprika in there? Looks delicious! I will definitely try it. Is there a cottage cheese substitute? The wrap looks yum! 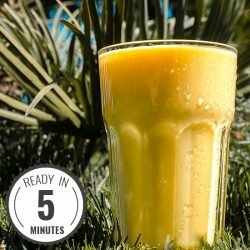 I’m always for anything tangy and now that you have also shared the recipe, i cannot just miss out on trying it. Thanks for sharing.